German Christian Democratic Party, CDU, chairwoman and Chancellor Angela Merkel addresses a news conference after a party's leaders meeting at the headquarters in Berlin, Germany, Oct. 29, 2018. For the second time in a month, voters in a regional election in Germany have rebuffed Chancellor Angela Merkel’s governing coalition, further confirming that the political landscape in the country is transforming rapidly.Merkel has announced she will not seek reelection as chair of her party and said her current term as chancellor will be her last. Voters in a regional election in the prosperous state of Hesse deserted in droves both Merkel’s Christian Democrats and the junior partner in her Berlin government, the Social Democrats (SPD). Coming on the heels of an electoral setback for the governing coalition in Bavaria earlier this month, the trouncing in Hesse, which saw the Greens the biggest beneficiary, prompted questions about whether this defeat will ultimately spell the end of Angela Merkel. “Of course, we in the Christian Democrats are not happy. We need a new work culture in the governing coalition and a regeneration of the Christian Democrats,” said Annegret Kamp-Karrenbauer, the CDU’s secretary-general. Pressure from within the Christian Democratic Party, CDU, was already mounting on Merkel before Sunday with internal critics saying at the very least she should not stand for reelection as the leader of the CDU in party elections scheduled for December. On Monday, Merkel acceded, confirming she will not seek reelection in December although she would stay on as chancellor until her current term ends in 2021. "I will not be seeking any political post after my term ends," she said. Merkel, 64, has led her party for 18 years and served five terms as Germany's chancellor since 2005. While Merkel’s CDU emerged as the leading vote-getter in Hesse, a state the party has dominated for two decades, it was expected to secure just 27 percent of the vote — more than 10 percent less than in an election five years ago. According to exit polls and projections from the provisional stages of the count, the Social Democrats are expected to lose as much as 11 percent from their previous total, and secure around 20 percent of the vote. Sunday's election is adding to the picture of a fragmentation of German politics, testimony to the continued resonance of the 2015 migration crisis. It confirms the country's once traditional parties are in decline and are seen by a swathe of the electorate as no longer representing them adequately. In Hesse, the Greens’ share of the vote jumped from 8 percent to 20 percent; and the far-right Alternative for Germany, AfD, appeared to be on track to garner a 12 percent share. German Chancellor Angela Merkel attends a board meeting following the Hesse state election in Berlin, Germany, October 29, 2018. Known by some as the "Iron Lady" of German politics, Merkel is increasingly beleaguered and even her most faithful supporters are not convinced she will be able to see out her full electoral term due to end in 2021. Since the CDU’s poor performance in last year's national parliamentary elections, Merkel has been beset by one crisis after another. Last month she lost her key parliamentary henchman, Volker Kauder when he was ousted by disgruntled coalition lawmakers. Merkel's grand coalition has come close to collapse this year over migration issues and a scandal involving the country's spy chief. Sunday's election is likely to have far-reaching consequences by adding further pressure on all the partners in Merkel’s national government to assess the viability of a coalition that is doing none of them any electoral good. One third of SPD members were against joining Merkel's coalition in the first place after last year's federal elections. “The state of the governing coalition is not acceptable,” SPD leader Andrea Nahles said to party members Sunday after the results were announced. The problem for the traditional parties is how to halt the electoral fragmentation as the center ground of German politics erodes. As Germany's old political guard cracks, it is compounding Merkel's immediate problem of keeping intact her fragile coalition government, formed in March after four months of testy negotiations. “Where there are losses, there have to be consequences,” said Helge Braun, Merkel’s chief of staff, told the German public broadcaster ARD. But he did not elaborate on the repercussions. The electoral setback for the governing coalition in Hesse is all the more remarkable considering the state’s prosperity. Voters leaving polling stations expressed deep dissatisfaction with the condition of Merkel’s national coalition and complained about the constant infighting. 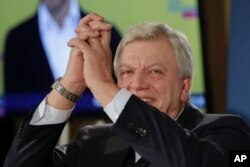 Hesse Prime Minister and Christian Democratic top candidate Volker Bouffier reacts to supporters at a party's election party after first results of the Hesse state election announced in Wiesbaden, Germany, Oct. 28, 2018. The Greens came second in the Bavaria election earlier this month.